History buffs can join about 50 re-enactors the 4th weekend in June, as log cabins and taverns come alive on the Pennsylvania frontier in the waning days of the American Revolution. 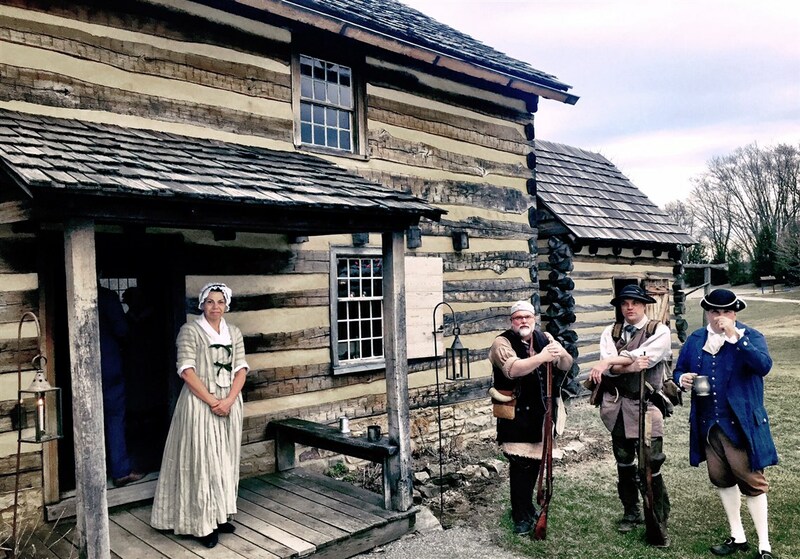 Indians, along with British soldiers and civilian loyalists, are part of a dramatic retelling of the 1782 demise of frontier outpost Hanna’s Town in Hempfield. 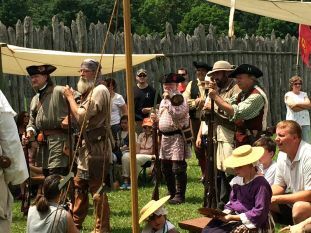 Although there will be no attacking Indians running out of the woods, visitors can get a glimpse of life on the Forbes Trail settlement up until the raiding Indians and British allies ambushed the town 225 years ago, said Rush Blady, who is helping to coordinate the event. — this time in simulation. Daytime activities include the usual Saturday afternoon fare in a frontier town: log-cabin building, leather tanning and militia drills. One of the log cabins at Hanna’s Town. Step back in time to when the Revolutionary War-era village of Historic Hanna’s Town served as the seat of government for Westmoreland County and held the first English courts west of the Allegheny Mountains. Sessions of Colonial Court, featuring actual cases heard at Hanna’s Town between 1773 and 1786, will be presented outside the tavern in Historic Hanna’s Town. Along with hearings for disorderly conduct and selling liquor without a license, cases will be presented against an “alleged” horse thief and an indentured servant girl accused of stealing clothing. Charges of treason will be heard. Noteworthy cases from the pre-Bill of Rights, more stringent court will be on display. “There was no transcript, so you have to guess who said what,” said Lisa Hays, executive director of the Westmoreland County Historical Society. One noteworthy case promises the thrills that only a “horse theft” trial can deliver, especially because Black Beauty-bandit cases were treated “like grand-theft auto is today,” said Joanna Moyar, education coordinator for the historical society. See how those who were convicted of crimes paid their debt to society in the 18th century. 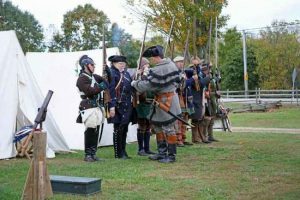 Historic Hanna’s Town volunteers and members of the Independent Battalion Westmoreland County Pennsylvania (IBWCP) will reenact selected cases. When evening falls, special tours will show the huddled survivors in the fort, where different perspectives on the raid will be shared. Reservations are required for the evening tour and cost $7 — or 70 shillings. Hanna’s Town was founded by by Robert Hanna. He bought 300 acres in the spring of 1769 because it was near ample water and the Forbes Road. In 1773, the first courthouse west of the Allegheny Mountains was established, for a county that stretched well past Fort Pitt. Suits began flying because Virginia and Pennsylvania each saw this slice of the wilderness as its own. The Virginians set up their court at Fort Pitt, which they called Fort Dunmore after Governor Lord Dunmore. Hanna’s Town glory days were short-lived, though. On July 13, 1782, a joined force of British troops and Indians burned the community — killing two and capturing many more. “Most people left and Hanna’s Town never recovered,” Ms. Hays said. The town was active for less than a decade. Five years after the fire, the county seat moved to Greensburg. The good news is the land was purchased by the Steel family in 1826, who kept it for more than 140 years before the county bought it with the help of a state grant in 1969. The land still looks much as it did centuries ago, but it’s now a 180-acre county park punctuated with trails. It’s much easier to envision the isolation of the frontier families there than it is at the Fort Pitt Museum, now by an interstate. Offering another outlook will be three Seneca Indians from Salamanca, N.Y. They will answer questions and demonstrate customs of the Seneca lifestyle. Children’s activities include joining an Indian scout and playing period games. “The Senecas are our honored guests,” said Blady, who will wear an authentic period ensemble — featuring a smock, oval spectacles and buckle shoes. More than half of the participants in the re-enactment are local, Blady said, but some are coming from as far as South Carolina and Massachusetts. The group of homesteaders, makeshift soldiers and British foes will camp out at the site. Hays said she hopes the commemoration will draw attention to Hanna’s Town, which she called “the missing link” in the Pennsylvania parade of forts and settlements. The 225th anniversary also will be marked by construction on a new log cabin for the historical site. Blady said participants plan to construct a cabin “based on Hanna’s original deeds.” The crew expects to finish only the walls of the structure, so they will “raise the roof” at a future event. Dates: Saturday, June 24-Sunday, June 25 (2017) – usually the 4th weekend in June, but call ahead to confirm dates.